Has any single pound of cherries ever been so decadent? I’m not so sure. And I’m not so sure it should ever be again. The hardest part of buying cherries is not polishing off the entire bag before you even get to your bookmarked recipes. It’s a difficult race to pit the cherries fast enough for the 2-Year-Old. Because when I fall behind, she simply pops a whole one into her mouth, stem, pit, and all. After making the Roasted Cherry Chocolate Cake for Project Pastry Queen, we were (I was) hooked on roasted cherries. I’ve had these brownies from Annie’s Eats bookmarked since last summer. Roasted cherries and dense, fudgey brownies? Sign me up. I roasted the cherries in some of our port to concentrate the rich berry flavors and then folded that almost magical reduction into my current favorite brownie recipe – Ghirardelli Dark Chocolate Brownies. I have a couple of friends who swear that no homemade brownie can touch a from-the-box brownie. And after one bite of the Ghirardellis, I can at least temporarily agree. For the sauce, I was looking for something less sweet. something to pair with the rich brownies and sweet vanilla bean ice cream. We simmered more cherries in more port to make a very grown-up topping for a very grown-up sundae. I can’t even imagine how many miles in 863% humidity I’ll have to run to wipe that brownie sundae off the books. It’s probably better if I don’t dwell on it. A rockstar brownie sundae celebrating cherry season: rich brownies studded with cherries roasted in port wine, topped with vanilla ice cream and a roasted cherry-port sauce. Remove stems, pit cherries, and then cut in half (or quarters if very large). Place in a small baking dish with 1/4 cup of port. Roast for 30 minutes, until the cherries are very soft and the port has slightly reduced (you'll have 2-3 Tbsp of liquid). Set the cherries aside to cool while you prepare your brownies according to directions. Reduce oven heat according to your brownie recipe. As the last step in making the brownie batter, stir in the cherries and accumulated juices and then transfer to the baking pan. Bake until a knife inserted in the center of the brownies comes out with moist crumbs attached (~45 minutes in my oven). To make the cherry port sauce, remove the stems and pits from the remaining 1/2 lb cherries. Quarter the cherries and then coarsely chop. Add to a small sauce pan with the port and sugar, cooking over medium-high until it begins to boil. Reduce heat to medium and simmer for 35-40 minutes, until very thick and syrupy (you'll have ~1 cup of sauce). 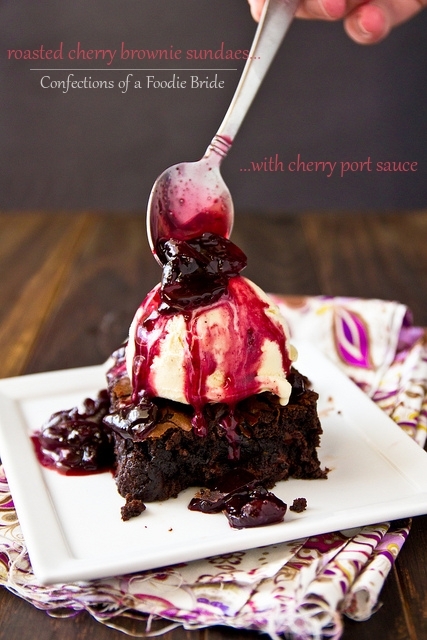 Serve brownies topped with a scoop of ice cream and a spoonful of warm cherry-port sauce. Leftover sauce will keep in the fridge for several days, serve rewarmed. Such a wonderful combination of flavours! Those look and read decadently. Those brownies look amazing! I must admit, I’ve never had a brownie that beats out the Ghirardelli boxed version. Cherries are almost in season here in MD, so I’m definitely bookmarking this recipe! Oh my gah, so glad I bought a bag of cherries this week! I’m so envious that you can already buy cherries! They just started showing up in the stores here but they’re still too expensive to justify at this point… This sounds like a phenomenal dessert! I’ve never seen such a gorgeous brownie sundae before. The cherries and sauce are the perfect topping. What a sundae! Can’t go wrong with cherries and chocolate. I would seriously hang that first photo on the wall of my kitchen. Beautiful. Wow, this looks beautiful and delicious. I might consider running for a few days in order to eat one of these. Oh, come on! So many layers of awesomeness here! What a fabulous photo! It makes me want to eat the sundae right off the page. What a beautiful dessert! I love the pairing of brownie and ice cream. port + cherries = best combo ever! Gotta go pick me up a bag of cherries! This is not to be dwelt on, you’re righ…unless you’re dwelling on whether or not to have seconds (major YES!). Ohhh want want want. This is such a stunning dessert! This looks so amazing! I would like to try to make it, but…what is Port? Is it a liqour? What is it that you used? It’s a dessert wine – sweeter and higher alcohol content. It’s very, very good. Beautiful and mouthwatering! 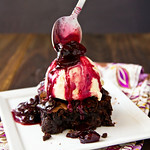 Brownie sundaes are the best, and the cherries look like they probably give it a perfect tartness! WOW, these look incredible!!! What amazing flavors – so decadent…this may be the perfect dessert! Absolutely love the cherry & chocolate combo! So these are sweet cherries, like Bings, rather than pie cherries that are pretty sour to eat raw? Did I miss that? I’m so glad it’s cherry season! I make these cherry cookies that are my husband’s favorite, and he would probably love me forever and buy me jewelry if I made these brownies! Roasted cherries… what a fabulous idea. I made this dessert today for Father’s Day and everyone loved it! I didn’t use port because I am pregnant and my three year old also ate it. I roasted the cherries with sugar and used an apple berry cherry juice in place of the port for the sauce. This dessert was a HUGE hit at our father’s day BBQ! Thanks so much! Roasting the cherries in port is such an elegant twist to this gorgeous sundae! Um i tend to dislike the maraschino cherries that normally come on top of sundaes but roasted real cherries sound like they would be SO. MUCH. BETTER.